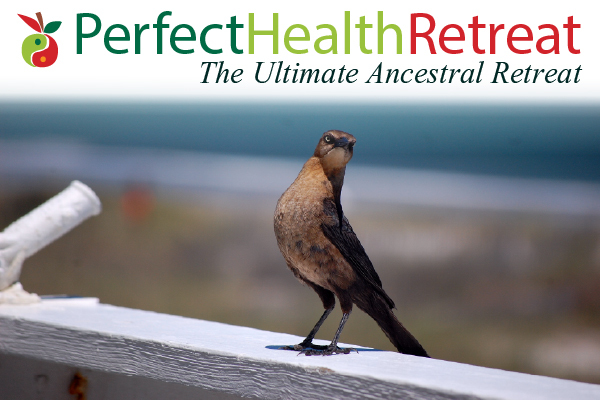 I’m pleased to announce that we are accepting reservations for the May 2-9 Perfect Health Retreat. It’s going to be the best retreat yet. One reason is that we have a new partner: Ubiome.com. Ubiome will provide two free Gut Kits to every retreat participant, one for pre-retreat use and one for use at the close of the retreat. They, and we, want to see what effect the Perfect Health diet and lifestyle has on the gut microbiome. For our guests, it is a great chance to sample the gut microbiome and see how it correlates with personal health. Daily science classes, led by Paul, on six topics – diet, nutrition, lifestyle, exercise, gastronomy, and managing your health and weight – providing a complete education in how to achieve the best possible health and a long life. Twice-daily cooking classes teaching practical home cooking methods. Learn to be an intuitive PHD chef and meal designer, able to generate delicious and healthful food for your family in 30 minutes per day. Thrice-daily movement classes, led by our staff of personal trainers, providing a complete hands-on training in all modalities of movement – including physical activity, relaxation and stress relief, and mobility and healing. Gourmet PHD food prepared by Chef Chris Gates, who has served as private chef for Steve Winwood, R.E.M., Carlos Santana, and Widespread Panic, cooked for Hollywood stars such as Drew Barrymore, Ashley Judd, Sandra Bullock, Martin Lawrence, and Freddy Prince Jr, and worked with top chefs including Iron Chef Michelle Bernstine and James Beard Award winners Hubert Des Marais, John Fleer, and Mark Gallaudet. Pre- and post-retreat health coaching from Paul, helping to troubleshoot and fix any personal health issues, in exchange for sharing your post-retreat health outcomes. This includes Ubiome.com gut microbiome sampling. A luxury vacation at the finest property on a magnificent beach, complete with two heated salt-water pools, two hot tubs, all the amenities and personal care you’d expect at a luxury resort, and an environment optimized for health that models ideas you can implement at home. Room choices are made in the order in which reservation deposits are paid, so there are benefits to reserving early. To make a reservation or inquire for more details, contact Paul at paul@perfecthealthretreat.com. if it was shorter (~ 5 days) & in the W coast, i’d love to go. Sounds amazing. But not possible for me with small children at this point in my life 🙂 Just wondering, Paul or anyone else, do you know of a ‘healthy’ holiday destination, preferably in Europe, that has salt water pools. All these all inclusive destinations I’ve come across have poor quality food and chlorine pools. I wonder if there are other options for healthier all inclusive holidays that would give the mum of the family a break from cooking. The reason our retreat center has salt water pools is that it is right on the beach in hurricane country, and the storm surge from any major storm would flood the pools with salt water. So salt water pools cut down on maintenance. If you want a salt water pool, I’d look for a resort on the beach in an area subject to storms or large tides. I am excited. I also wanted to hold something like this. I am sure that it will help a lot of people and it will change their lives. Can you explain why coffee is considered good even though it is obtained from a bean? Would it not have toxins the same way any other food from beans would? Coffee might be colloquially referred to as a bean, but it is actually the seed of a fruit called a coffee cherry. Along the way to becoming the coffee that you drink, the seed is fermented and roasted, and probably the fermenting process adds to its healthy qualities. Ahh, I didn’t think of the fermenting process. I hope to hear more from Paul on this. Fermenting or not, coffee is not a bean.